This room contains a queen and a single bed with own ensuite tea and coffee making facilities table and chairs,with T.V. and reverse cycle airconditioning. This room has a queen and 2 single beds T.V. revearse cycle airconditioning,ensuite,tea and coffee making facilities,table and chairs. 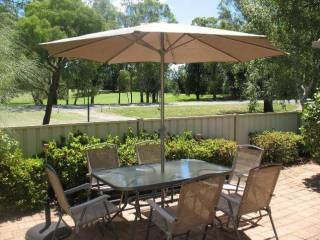 The Country Inn offers a variety of clean and comfortable Cobram Barooga accommodation.Cobram Barooga Golf Club house is situated directly opposite the motel, which is surrounded by its 36 hole golf course. Each room at Barooga Country Inn Motel is situated on the ground floor. Guests have access to a spa pool, guest laundry and outdoor barbecue area. Free off-street car parking is provided. Hot and cold buffet breakfasts are served each morning. Every room looks into a secluded courtyard with swimming pool and barbeque areas or onto the golf course. Located opposite the golf club, Barooga Golf Course Motel is just 8 minutes’ drive from Cobram town centre. Barooga Botanic Gardens is 5 minutes’ drive away. Conference facilities are available. All units are non smoking, guests are responsible for any damage caused to units, no undue noise after 11 p.m.
A minimum of 48 Hours prior to check in date will incur a $ 20.00 cancellation fee. Any cancellation made within less than the 48 hour period will incur a minimum of 1 night accommodation.